Pig Minds Brewmaster and General Manager Carson Souza encourages customers to give the brewery’s vegan menu a chance. The name Pig Minds Brewing Co. may conjure the image of a barbecue joint, but don’t let the sign fool you. The restaurant, located near Route 173 in an industrial area of Machesney Park, is a microbrewery that sells only vegan food. Before you completely write off Pig Minds, 4080 Steele Dr., Machesney Park, give the food a chance, says Carson Souza, brewmaster and general manager. There are no animal-derived products on the menu – not even eggs, dairy or honey. 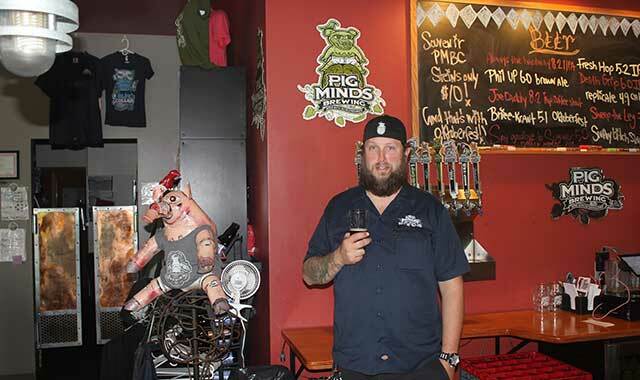 Owner Brian Endl developed the concept of a brewery/vegan eatery and opened Pig Minds in 2012. He and his wife Kelly have been vegans for about 25 years and their teen son, Everett, has been vegan all his life. The name Pig Minds make you think of a smoke house, but the name is part of the vegan concept. The beer at Pig Minds is brewed, bottled and distributed on site. There are 10 beers on tap, and eight to 10 bottle choices. Larger, 22-ounce bottles can be purchased throughout northern Illinois. Customers enjoy watching the beer-making process from the dining area, Souza says. Instead of hamburgers on the menu, Pig Minds serves The Pig Mind Burger, made of black beans and quinoa, with guacamole spread and chipotle aioli. Instead of a traditional BLT, Pig Minds serves a TLT, with smoked, fried tofu, lettuce and tomato. The restaurant also has a fried green tomato sandwich, served with chipotle barbecue and coleslaw on a toasted baguette. Other menu favorites include tempura cauliflower, fried avocado tacos, hand-cut fries, sweet potato wedges, bruschetta, onion rings, various salads and sandwiches, and fresh hummus of the day served with warm pita bread. Some folks avoid the pub because of the vegan menu. “You can still come for the beer,” Souza reminds them. Over the next few months, Pig Minds plans to add 6,000 square feet to its establishment for a production facility. The project is being held up because of the Federal Emergency Management Agency (FEMA). Souza wants people to visit Pig Minds with an open mind. He says the high food quality may surprise some people. Pig Minds is open 3-11 p.m. Mon.-Thurs., noon to 1 a.m. on Fri.-Sat. and noon to 8 p.m. Sunday. Learn more at pigmindsbrewing.com or call (779) 423-2147. Pig Minds can also be found on Facebook. This entry was posted on Wednesday, November 16th, 2016 at 12:00 pm	and is filed under Dining Guide, Top Posts. You can follow any responses to this entry through the RSS 2.0 feed. Both comments and pings are currently closed.